Wilder Pickard opened shop in Edgerton, Wisconsin. in 1893, and then moved the company to Chicago around 1900, according to pickardchina.com. The company served only as a decorating studio early on. They employed skilled artists who specialized in hand-decorating art pieces, dessert sets, and tea sets. When Did Pickard Begin Manufacturing China Dinnerware? Austin Pickard, Wilder’s son, joined his father’s business in the late 1920s and began to work on fine china production. In 1930, he moved the company to its present Antioch, Illinois. location. By the late 1930s he began manufacturing white ware china. The same formulation is still used by Pickard to produce fine china today. In Pickard's modern era, the company has been commissioned to make dinnerware for the Department of State embassies, Air Force One, Camp David, the Queen of England, and numerous businesses such as Hilton Hotels and General Motors. Did the Company Decorate in Other Styles Besides the Popular All Over Gold Etched Décor? While an encrusting of gold covered with etched designs (referenced as all over gold or AOG by dealers and collectors) easily identifies some Pickard works at first glance, the company also manufactured many lovely pieces prior to these which featured colorful and intricate hand painted decorating. This includes numerous floral designs along with some portrait pieces and rare scenic paintings. 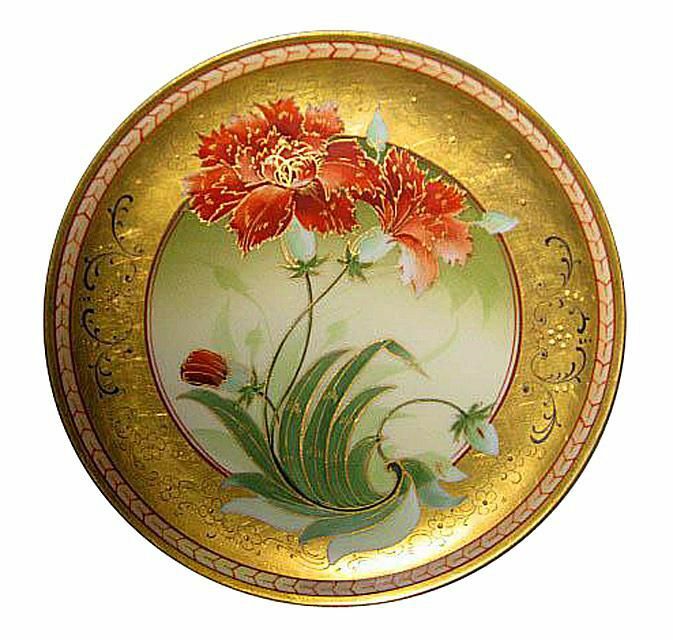 These items were professionally painted by skilled porcelain decorating artists, are usually of very high quality, and generally more valuable than the aforementioned all over gold designs. What Are Some Characteristics of the Most Valuable Pickard Pieces? Like most hand-decorated porcelain dating to the turn of the 20th century, value lies in how skillful and unusual the décor happens to be. More common florals are generally less valuable than hard to find scenic or portrait pieces, since collectors favor these hard to find items. Collectors also readily seek artist signed pieces featuring the name or initials of the decorator, and this drives up prices on those pieces. Some of the most highly-coveted names to watch for, according to The Pickard Collector’s Club, are Yeschek, Challinor, Cirnacty, Seidel, Gifford, and Fuchs. Exceptionally large or small pieces and other rarities will also be more valuable than average-sized items as will the oldest pieces of Pickard which were marked with paper labels (so they may be unmarked when found today). Unusual items beyond the numerous tea sets and dessert sets such and candlesticks, perfume bottles, and shaving mugs, are also very desirable to Pickard collectors. What Does It Mean When a Pickard Piece Has Two Marks? Early Pickard pieces often have two marks, like the cabinet plate illustrating this article, and some will also have an artist's signature (as mentioned above). One of the bottom stamps is usually an underglaze mark (such as a mark from a manufacturer operating in Limoges, France) indicating the company that made the white ware “blank,” and then the Pickard mark was added after the item was glazed indicating the studio that decorated the piece (and there were many decorating studios who were Pickard contemporaries, including D’Arcy’s, Donath, and White’s Art). Pickard purchased and imported blanks from various factories in the Limoges region of France, Bavaria, and Japan along with white ware manufactured in the United States. In the mid-1930s, after the company moved to Antioch, they began producing their own blanks for decorating, according to pickardcollectorsclub.org. What Are Some Resources for Learning More About Pickard China? The Collector’s Encyclopedia of Pickard China by the late Alan Reed is a recommended resource for further learning. Although this book is now out of print, back issues can be located through used booksellers. The Pickard Collector’s Club also offers a list of Pickard marks taken with permission from the aforementioned book on its website, which is very helpful in dating these elegant china pieces.